South Bay Smiles, located in West Los Angeles, is home to Manhattan Beach cosmetic dentist Dr. Bradley Matthew, DDS, MICOI. If you are looking for an experienced Los Angeles cosmetic dentist serving the beach communities, including Manhattan Beach, El Segundo, Venice Beach, Hermosa Beach, Hawthorn, Westchester, Ladera Ranch, Santa Monica, and Marina Del Rey, look no further. Many patients come to South Bay Smiles to correct crooked, chipped, or dulled teeth. Dr. Matthew, DDS, MICOI, and his staff use the latest techniques in dentistry to help you achieve the teeth and smile you desire. He is dedicated to creating beautiful smiles and satisfied patients. Cosmetic dentistry is a subspecialty of dentistry that improves the aesthetic appearance of your smile. A cosmetic dentist is like an artist, shaping and re-creating teeth to make the perfect smile. Dr. Matthew, DDS, MICOI, received special training to create and shape teeth that look natural to fit each unique face. Cosmetic dentistry is different from general dentistry because general dentistry focuses on dental health and maintenance, whereas cosmetic dentistry seeks to improve the aesthetics and function of the teeth. Advancements have been made in cosmetic dentistry; the materials used are durable, have a similar feel to natural teeth, and can match the natural shade of teeth. Whether you desire to fix a crooked tooth, want whiter teeth, or need a smile makeover, Dr. Matthew can help you achieve the smile you want. We improve smiles throughout Los Angeles, Marina Del Rey, Santa Monica, Manhattan Beach, Venice, Hermosa Beach and the surrounding areas of Southern California. You can have the smile you desire. Please contact us today to set up a consultation with a Westchester cosmetic dentist. No, your new veneers will not look like fake teeth. Dr. Matthew, DDS, MICOI, is trained and has years of experience creating natural-looking veneers. The veneers will be designed to fit the proportions of your face, age, and gender. Can a cosmetic dentist straighten my teeth? Yes. Dr. Matthew, DDS, MICOI, offers Invisalign – a method of straightening teeth without metal braces. What type of teeth whitening is offered? South Bay Smiles uses the BriteSmile teeth whitening system. Will my dental insurance cover the costs of cosmetic dental work? It depends on the procedure. There are many people who require cosmetic dental work that is necessary for function and overall dental health, in which case it could be covered by insurance. If you have questions, please feel free to call us at (310) 670-0659. The foods, beverages, smoking, and medication we consume can dull the teeth. In addition, the enamel on our teeth degrades as we age, which can contribute to the yellowing of the teeth. We do everything we can to ensure our patients don't experience discomfort during teeth whitening. Some may experience tooth sensitivity after a teeth-whitening session. This typically doesn't last long and should go away within a day. I am missing a tooth. What is the best option for tooth replacement? Those who are missing teeth and would like them replaced are good candidates for dental implants. Please visit the dental implants page for more information. A smile makeover is when Dr. Matthew, DDS, MICOI, uses various procedures to improve a person's smile. A smile makeover can include some veneers for a gap, teeth whitening, or dental implants. The makeover depends on the individual's unique smile. Does Dr. Matthew, DDS, MICOI, perform smile makeovers? 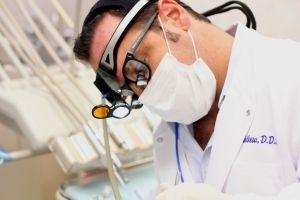 Yes, Hermosa Beach cosmetic dentist Dr. Matthew, DDS, MICOI, performs smile makeovers! Please contact us for more information. Looking for Hawthorne veneers or West LA cosmetic dentistry? Contact South Bay Smiles today!